One of the most remarkable, that is to say shocking, aspects of our current politics is the enormous degree of self-delusion that inflicts so many politicians and so many citizens. It seems to be an epidemic, or even a pandemic of ignorance that takes over minds and sickens them in the same way the great flu pandemic one hundred years ago infected so many millions world wide. Theresa May: Going down with Britannia? 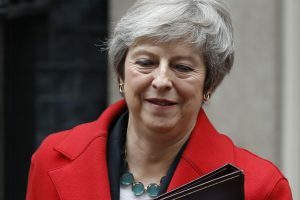 British Prime Minister Theresa May, for example, is hanging on by her fingernails, continuing to maintain the unalloyed fiction that the United Kingdom leaving the European Union will somehow be good for the British economy. The Brits call it Brexit and May and her self-delusional fellow Conservatives – and more than a few in the Labour Party – have been fussing for months over the terms of the exit from the European common market. It is obvious now – as it was obvious when the U.K. voted to leave the EU – that accomplishing the trick of separating from Europe and still maintaining all the advantages of staying in Europe would simply be impossible. Yet, the delusion continues, while May’s government comes apart at the seams. It reminds me of one of the old silent film comedies produced by the legendary Mack Sennett – a bunch of clueless Keystone Cops running into walls, jumping through windows, generally making no sense whatsoever, while acting like they have it all under control. 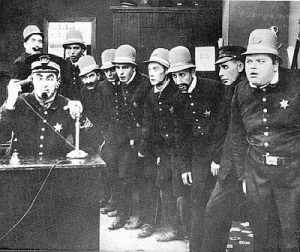 Keystone Kops or pro-Brexit British pols? That is rather like your mother insisting you eat your peas and promising that you will have absolutely nothing to say about it the next time peas are served. The smarter British politicians, May included, knew Brexit was a farce, but went along with the farce to maintain power … or something. The same type of delusion is rampant in Donald Trump’s America, particularly prevalent in the deep delusion infecting the Republican ruling class in Washington, D.C.
Republican politician after Republican politician labeled Trump unfit, a clown, a con man, a disaster, an ignorant buffoon and now – I’m thinking of you Lindsey Graham – they can’t get enough of their joker-in-chief. Trump hasn’t changed. “Deliberate unknowing” has, however, become the GOP’s SOP. Right. Some kind of victory. Democrats won 35-plus seats in the House of Representatives, taking control of that body. They held off what might have been a blood bath, while defending a slew of vulnerable seats in Senate. And they repaired much of the Midwest damage the party suffered in 2016 by winning a number of governor’s races. Oh, yes, Democrats picked up two Republican held Senate seats, including one in Arizona that has been in GOP hands since 1995, and now Democrats hold every congressional seat in Orange County, California. That Trump news conference was, of course, where the president created the pretense to strip a CNN reporter of his White House credentials. A silly, self-delusional move by Trump and a White House staff ever more unmoored from reality. O’Toole’s second category of ignorance is the “crass self-delusion” mentioned at the head of this piece: the ability to convince yourself that a long-held ideological position is correct in the face of vast evidence to the contrary. Our national political delusion in this category could be something like, oh, the huge Trump-GOP tax cut. The tax cut was, or course, promised as a amazing boon to the middle class and a launching pad for vast economic growth that would “pay for itself.” Senate Republican Leader Mitch McConnell actually proclaimed, ““I’m totally convinced this is a revenue-neutral bill.” It wasn’t. Now – big surprise – McConnell says we’ll need to cut Medicare and Social Security to address the deficit created by the tax cut that was going to pay for itself. Oh, well, in the age of Crass Delusion, with a president who lies with reckless abandon about absolutely everything, it may seem more comfortable to cling to the ideologically certain end of the ignorance continuum rather than grapple with messy old facts. By the way, the Toronto Star’s Daniel Dale has done us a big favor. He’s actually been tracking Trump’s lies since Day One. It’s a big job, taking a mild-mannered Canadian – they really are our best friends – to keep track of the American president’s delusions, er, lies. Dale calculates “3,749 false claims” since Trump’s inauguration, the job of tracking the lies made easier by the frequency of repetition. “On his fifth day in office, Trump baselessly alleged widespread voter fraud,” Dale wrote recently. “He did the same thing this past week. In his third month in office, Trump falsely claimed that the United States has a $500 billion trade deficit with China. He has said the same thing more than 80 times since. “The Democrats want to invite caravan after caravan of illegal aliens into our country. And they want to sign them up for free health care, free welfare, free education, and for the right to vote.” – Donald J. Trump just before the mid-term elections. The final O’Toolean category of delusion is what he calls plain old “pig ignorance” as in “the genuine hallmarked, unadulterated, slack-jawed, open-mouthed, village idiot variety.” In Trumpworld where to begin? How about we send several thousand U.S. soldiers to the Mexican border at tremendous cost and at no small disruption to their personal lives. Let’s succeed in politicizing the military as part of a pre-election stunt in an effort to stop a “dangerous caravan” of displaced persons – poor, tired, desperate people – who pose absolutely no threat to the United States. Or, how about this for pig ignorance? Appoint a grifting hot tub entrepreneur to run the U.S. Justice Department and somehow think that is either proper or a good idea. Trump might well succeed in getting his new acting attorney general, Matthew G. Whitaker, to fire special counsel Robert Mueller in hopes of heading off the continuing investigation into Russian interference with our elections and potential Trump campaign involvement in that interference. But do any but the most delusional among us think that Mueller can’t outfox a guy who once tried to raise money using bitcoin to finance research into time travel – this is true, by the way – and seems pretty sure Bigfoot is a thing (also true)? I’ll put my bitcoin on the former FBI director and decorated Marine combat veteran. 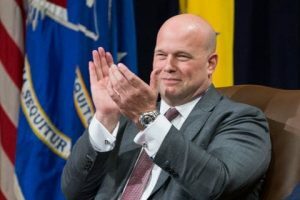 And I’d take double or nothing that Whitaker is gone in about three Mooches. Or, we could demonstrate our real grasp of reality by uniquely blaming the massive and deadly California wildfires on a lack of proper forest management rather than the real culprits – extended drought and the effects of ever worsening climate change. 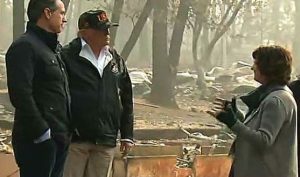 Trump actually suggested “raking and cleaning things” would eliminate the causes of the massive fires. No, really, he did say that. And we could make those claims even as the administration’s own budget proposal for the Forest Service and Bureau of Land Management actually calls for reduced funding for approaches that might help mitigate some of the effects of wildfire. “Pig ignorance” is living your entire adult life in a gilded enclave in Manhattan, never getting out of a bubble made of your own self-delusion and faking that you could tell a fire line from buffet line. In all their ignorance the Brexit hardliners may well succeed in destroying the U.K. economy and crippling European unity at the very moment dystopian nationalism is on the rise on the continent and in Trump’s own fevered imagination. O’Toole reminds us of how wacky the language of the pro-Brexit crowd has been and Trump’s rantings aren’t that far removed. “Napoleon, Hitler, various people tried this [unifying Europe], and it ends tragically,” the loathsome Boris Johnson said just before Brits voted to drive themselves off a cliff. He was suggesting that the European Union was attempting this dastardly Hitlerian deed of unity “by different methods” than the Nazi’s or Napoleon used, but that the effect on the U.K. would be just the same as Trafalgar and the Blitz of 1940. This entire business is a paranoid fantasy, a political psychosis, which sounds much like the daily news feed out of the White House. No doubt we are stuck with Trump and all his delusions and ignorance for some time to come. His GOP enablers appear to be ready to double down on a strategy of hanging with him while he hangs them out. The mid-terms may have put up a political speed bump on the highway of craziness, but the deliberate unknowing, crass self-delusion and pig ignorance seems sure to continue. One entire political party has embraced nonsense. Which is not to say that we can’t stop any time we want from buying into wacko conspiracy theories and easily proven fallacies and we can stop listening to raving, ignorant people. Maybe the Brits will yet come to their senses. Perhaps we will, too. Thomas Jefferson actually wrote something about this into the Declaration of Independence. “Let facts be submitted to a candid world,” ol’ Tom wrote. Good lord, let’s get on with that idea. Pig ignorance is just so stupid. Previous post Will Brad Little Make a New Beginning..